People ask me: Why do you write about food, and eating and drinking? Why don’t you write about the struggle for power and security, and love, the way others do? People don’t often ask me why I write about science, and not politics or economics or culture or war…the way others do. But I’ve asked it of myself, and I find myself lining up with Fisher. * Science is so utterly intertwined with how we live that to write about its history, its discoveries, its many discontents, implications, way of thinking, is to interrogate politics, culture, conflict, philosophy and everything else…food included. But still, writing about science is not just a sneaky way to comment on Republican anti-rationality or whatever; it’s not just a means to another end. I’ve written a book about the science of climate change, and though that book is as much about politics — and human nature — as it is about carbon chemistry and Milankovitch cycles, I remember one encounter I had while researching it. Which is to say that there is simple pleasure to be had in the scientist’s life, or better, for most of us who aren’t practicing researchers, in a science-infused view of life. Sometimes, there’s just the fun of the imagination leaping from the forest to the diamond; sometimes it’s the joy of the puzzle; or the adrenaline rush of the extraordinary (did you know a wolverine can bring down a moose? I didn’t until I read this);or — and this is what I think first drew me into the story — it’s simply those moments when science offers up a glimpse of pure, disinterested, astonishing beauty. 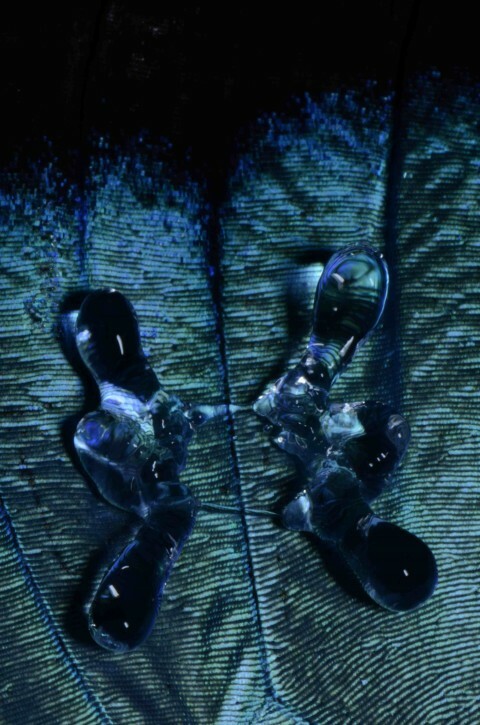 This image was made with the help of a friend and sometime co-blogger of mine, Dr. James Bales, assistant director of MIT’s Edgerton Center and a master of high speed photography. 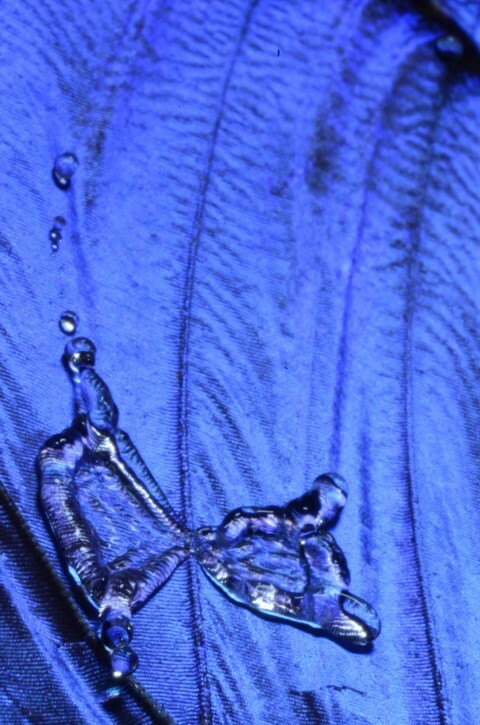 It shows a drop of water striking the wing of a a blue morpho butterfly. 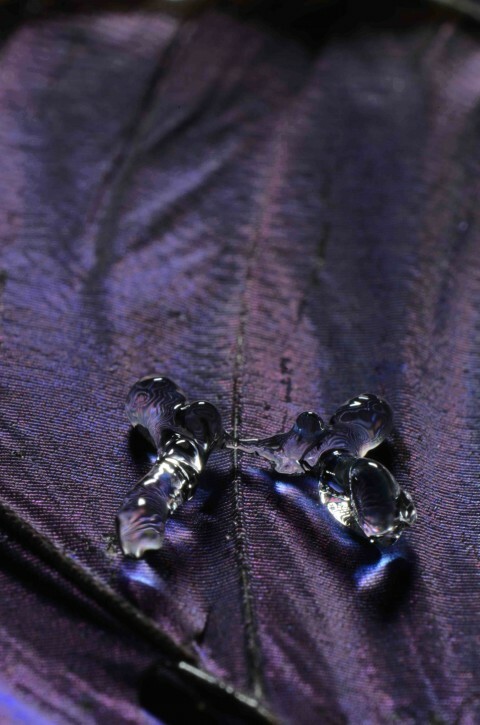 It came about in the context of the work of a group of researchers at or recently of MIT who have been studying how to reduce the contact time between water and hydrophobic surfaces. Cutting the interval during with sprays of water remain on such surfaces matters to applications like preventing icing on aircraft wings. It turns out that engineering surfaces with tiny ridges does the trick — so far, the team has managed to reduce contact time by 40%, using surface configurations that can be achieved with readily available tools. More details here. That’s all well and good — in fact, better than. As someone who flies pretty regularly out of Logan Airport, I’m all for anything that erodes the threat of icing. …which are to me, before anything else, simply beautiful. *People also rarely — never — juxtapose me with Fisher, but that’s another kettle of fish. I read her; I get to quote her. For the ubergearheads among us, Jim reports that the image was made with a Nikon D700, mounting a 70-180mm lens (presumably Nikon’s old macro unit), with a 1.4 teleconverter, a StopShot trigger unit (from Cognysis, in the US) and an Ultra Micro Flash from LaserScribe (an outfit in the UK) which has a flash duration of approximately 10 microseconds. ***Two more images for your delectation can be found below. All images: credit A. T. Paxson, K. Hounsell, J. W. Bales, J. C. Bird & K. Varanas, used by permission. Hey, all — or at least all of you in reasonable range of Cambridge, MA (Our Faire City). Day after tomorrow, Thursday, October 24, will see writer, performer and curator Coco Fusco talking at MIT, in an evening moderated by my colleagues, novelist Junot Diaz and Cool Japan majordomo Ian Condry. The event begins at 5 and 7 p.m in MIT’s Media Lab rm 633. Details and map here. Fusco’s title, “A Performance Approach to Primate Politics” leads to the meat of her talk — which investigates what “Planet of the Apes” (the original) was really talking about. Smart people taking on the world at an angle. Should be fun.